Hello, and a marvelous middle of January to you! Welcome, or welcome back, to my newsletter. The photo above shows me at the very end of an energy medicine workshop, feeling so loved and so connected to my fellow students, I am almost crying in celebration. Please take the time, as this new year is getting fully underway, to celebrate the joys in your own life. Today's issue has 2 articles, the first on vision and enjoying looking for longer periods of time. The second article is about automatic "but..." objections to what may be a very good idea. Before that, I'll say a bit about my business name change. Enjoy! My business name is now "Nancy L. Neff Coaching and Healing", with my website being NancyLNeff.com, and my business email being Nancy@NancyLNeff.com. This should not cause any disruption for you, as the former website name will still work, and I'll be checking the old email account for a while. The previous DreamerSight name has confused some people, who may have wanted to work with me yet had no interest in dreams. Or perhaps they had different issues than eyesight or insight blur. Or when I said the name, they heard "site" instead of "sight". My new name is a better representation of my business, to which I'm bringing all of my skills. So I'm still here and it's easier than ever to find me. May you become more of who you are in this new year too. When I started vision improvement almost 15 years ago, I found to my dismay that I wasn't looking at much. I had the terrible habit of glancing to take a mental snapshot of the view, then examining that instead of continuing to look at what was in front of me! Once I began using my eyes and mind to really look, I was so afraid of committing the dreaded visual sin of staring, I darted my glance all over the place! All the vision improvement books had told me, "The healthy gaze is constantly moving". Once again, I was over-doing it. 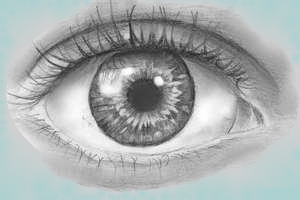 Moving my gaze can be slow and gentle, or from one side of a letter on the eye chart to the other. It doesn't have to be from the floor to the ceiling! So let yourself look, allowing your gaze to travel easily over the details of the scene, whether it's in the distance or up close. Notice, and examine, then move on to notice something else, as if you're a visual pioneer exploring new territory. What could that object be? And have fun with it -- let your vision delight you! For more about my personal experience with learning to look for longer periods of time, and enjoying it, click here for a post I wrote on the Imagination Blindness vision improvement site. EFT: Have you noticed your "but..." lately? In EFT training we're taught to spot "tail-enders", dismissive phrases which follow a statement, in essence denying its validity. This could be a sarcastic "Oh yeah, sure! ", or "That'll never happen! ", right after telling ourselves we can quit that bad habit, or go for that dream job or dream partner. Very often these tail-enders begin with "Yes, but..." as in "Yes, but I don't have the money! ", or "Yes, but I'm too old!". Using "but" in a sentence can mean you're negating everything that has come before, and now (after the but), you'll say what you really believe. If we do this a lot when talking about our goals and dreams, clearly we're "of 2 minds", not completely aligned with that goal we're saying we want to reach. So notice how you talk about what you want to accomplish. Sometimes these negative statements are so automatic, we often don't realize what we're saying. Haven't you heard "I'd love to get rid of my credit card debt, BUT I've always been bad with money." This kind of speech can keep you stuck. It's time to get rid of that Big But which is holding you back. If you're interested in exploring your own "but..." pattern with me, consider an EFT Coaching session. I'd love to work with you! Recently I've had a few requests for shorter sessions, either to get familiar with my work and style if you're new, or to address 1 or 2 short questions if you're a long-standing client. Send me a note here if you'd like to schedule a Discovery Session. Thanks! Let me know what you've wondered about concerning vision or dreams or EFT. I'll be glad to write a short article addressing that topic. Thank you to those who have sent me questions, or see a question you asked me in a private session written about here. You're helping many other people! Enjoy these luscious days of late January. I'll write again in a week or so. Take care!